Beginning in 1999, the American Psychiatric Association (APA) formed several workgroups tasked with updating the diagnostic and statistical manual of mental disorders (DSM) to be more consistent with the advances in the field since its previous publication. The personality and personality disorder (P&PD) workgroup was ambitious in their efforts to fundamentally redefine how personality disorder was diagnosed. They proposed a hybrid system that defined personality dysfunction along a single dimension of severity, and described different manifestations of personality dysfunction through a group of PD types (similar to PD categories in the DSM-IV) and dimensional ratings of pathological personality traits (Skodol, 2012). This hybrid system was criticized for being overly-complex, logically incompatible, and in need of stronger empirical support (Livesley, 2012a, 2012b), leading the APA to reject this proposal in favor of the existing DSM-IV PD diagnostic system that has been in use since the 1990s. The consequence of this rejection is that the PD section does not reflect any of the last 23 years of scientific advancement in the understanding of PDs. The P&PD workgroup proposal was placed in Section 3, a new section in the DSM-5 describing proposals in need of further research before officially accepting them into the standard diagnostic system. It is possible with sufficient research that all or some aspects of the proposal will be implemented in future DSM revisions. Consequently, there is a crucial need for research on these suggested revisions. The DSM-IV personality disorder section included 10 categorical personality disorders, diagnosed using a set threshold of PD symptom criteria (e.g. 5 of 9 symptoms met). Some of the central problems with DSM-IV PD diagnoses include the use of categories rather than dimensions to assess personality pathology, diagnostic categories that overlap significantly (co-morbidity) evidencing poor discriminant validity, and the most common diagnosis is a non-specific PD category (PD not otherwise specified) suggesting the 10 PD categories do not effectively describe many PD patients seen in routine clinical practice (Clark, 2005; Livesley, 2003; Watson, 2005; Widiger & Clark, 2000; Widiger & Trull, 2007). General Personality Dysfunction. Many of these concerns were addressed in the P&PD workgroup proposal for PD. First, the P&PD workgroup redefined personality disorder through the core impairments of self (coherent identity and pursuit of meaningful goals) and interpersonal (capacity for empathy and intimacy) functioning. The focus on self and interpersonal impairments is consistent with many theories of personality and personality pathology (Bender & Skodol, 2007; Bender Morey, & Skodol, 2011; Clarkin & Huprich, 2011; Luyten & Blatt, 2013; Pincus, 2011). This definition distinguishes personality disorder from other disorders whose core is better defined by affective (mood and anxiety disorders) or cognitive (delirium, dementia, psychotic disorders) impairments (Skodol, 2012), making it more precise than the DSM-IV definition which included other impairments (e.g. cognitive, affective, impulsive, etc.) that did not effectively distinguish PD from other disorders. The definition of PD was conceptualized along a single dimension of functioning, which some refer to as general personality dysfunction, or GPD (Livesley, 2006). The single dimension emphasizes what personality disorders share in common, which addresses the weakness of co-morbidity in DSM-IV diagnoses by suggesting all of these 10 PDs share the same pathological core (Lynam & Widiger, 2001; O’Conner, 2005). Consistent with this, summing scores of DSM-IV PD criteria into one total score evidenced high internal consistency (coefficient alphas 0.81, 0.90, 0.94, 0.96) demonstrating the existing PD criteria could be represented through a single factor (Hopwood et al., 2011; Morey, 2005). This single factor is more predictive of current and future (3 year) functioning across several domains (e.g. social, work, leisure, etc.) compared to measures of PD categories (Hopwood et al., 2011). Not only does this general dimension represent a simplification (10 overlapping categories to a single dimension) that may be more straightforward for clinicians, these findings also suggests that focusing on what the PD categories share in common provides more relevant clinical information than focusing on PD categories individually. Pathological Traits. The P&PD proposal explicitly distinguished what a personality disorder is (self and interpersonal functioning impairments) from the individual differences in how the disorder is expressed. The expression of PD is captured through 25 traits that aggregate into 5 trait domains (negative affectivity, detachment, antagonism, disinhibition, and psychoticism) included to recognize the growing consensus in the field to view personality pathology dimensionally (Widiger & Trull, 2007). This trait description (elevations across 5 trait domains) is more informative than the PD not-otherwise specified category, addressing a second major concern of DSM-IV PD diagnosis. These changes are evident in the revised criteria of PD diagnosis that require identifying the existence of a PD: moderate or great impairment to two or more aspects of self (identity, self-direction) and/or interpersonal (empathy, intimacy) personality functioning (A), and describing how that PD manifests: having one or more pathological personality traits (B). The remainder of the personality disorder criteria qualify criteria A and B, ensuring that A and B are inflexible and pervasive across a broad range of situations (C), stable across time and existing in adolescence or early adulthood (D), not better explained by another mental disorder (E), a medical condition (F), or a normal part of development or sociocultural environment (G). In addition, several PD types were retained (e.g. antisocial, avoidant, borderline, narcissistic, obsessive-compulsive, and schizotypal) to maintain consistency and familiarity across DSM-IV. Each of the 6 PD types is identified through specific and unique descriptions of criterion A. For example, impairments of identity differ across disorder types of narcissistic PD (emotion regulation mirrors fluctuations in self-esteem, exaggerated self-appraisal), Borderline PD (unstable self-image, excessive self-criticism, dissociative states under stress), and antisocial PD (egocentrism, self-esteem derived from personal gain, power, or pleasure). Each PD type also must meet elevated scores for several pathological personality traits. These number and proportion of traits differ by PD (e.g. narcissism requires meeting both of the 2 traits identified, while borderline requires 4 of 7, and antisocial requires 6 of 7). Several critiques of this proposal have been published (see Skodol, 2012 for a review), however many of the critiques are more focused on problems with describing the expression of personality disorder (criterion B) than the definition of personality disorder (criterion A). First, the proposal is overly complex for clinicians (First, 2005). This is not true of criterion A, which simplifies from 10 categorical disorders into a single dimensional continuum that emphasizes the core impairments that PDs have in common. In contrast, criterion B requires assessing 25 traits that comprise 5 higher order trait domains, which may be excessive for busy clinicians especially when personality pathology is not suspected. Another critique is that parts of the proposal are fundamentally incompatible. This is not true of criterion A, as it is just a single dimension. However, it is presently unclear whether pathological traits and prominent types can be cogently integrated to describe the expression of personality disorder. The diagnosis of PD types requires the assessment of 23 of the 25 traits, and for the clinician to evaluate criterion A using different definitions of self and interpersonal impairment for each of the 6 types (i.e. example of different identity impairments for narcissism, borderline, and antisocial PD described in the previous paragraph). This approach adds complexity, and is inconsistent with the spirit of criterion A which emphasizes the commonalities among PDs. Many researchers have voiced concern about this proposal, but the majority of critiques have been concerning the expression of PD: how many traits, what to label the traits, should traits be bipolar or unipolar, whether to use an existing trait model, how many (if any) PD types to include, and how to evaluate research to fairly determine this (Pilkonis, Hallquist, Morse, & Stepp, 2011; Pincus, 2011; Skodol, 2012). In fact, one of the only critiques of the GPD dimension is that it may be redundant with the trait descriptions, and some researchers wonder whether the severity of impairment to personality functioning can just be captured by the pathological traits. In contrast to this prediction, measures of global severity and pathological traits both incremented the prediction of personality disorder diagnosis (Hopwood, Thomas, Markon, Wright, & Krueger, 2012). Because the entire proposal is new, it lacks empirical research to justify such a sweeping change to PD diagnosis, which is one of the central reasons why it was rejected. Based on this review, it seems many of the short comings are associated with the description of how personality disorder manifests, not the definition of personality functioning. The present research seeks to move forward with part of the proposal emphasizing GPD (criterion A) since it is the most viable. It is also logical to begin building a research base for the proposal by addressing whether a disorder is present before attempting to describe individual differences in its expression (Pincus, 2011; Pilkonis et al., 2011). Now that the P&PD workgroup has offered a precise definition of personality disorder along a general dimension of functioning, research must evaluate the optimal methods for assessing it. Interpersonal theory provides a useful framework for this purpose because it A) is a pantheoretical framework for understanding personality pathology B) comprehensively marks self and interpersonal dysfunction through the constructs of agency and communion C) has a simple scoring routine (elevation) to capture severity D) can also be used to describe how individual differences in personality features are expressed and E) has clinical utility. Pantheoretical. Since the DSM5 is atheoretical, it is important for a psychological construct capturing criterion A to not be wedded to a specific orientation (e.g. object-relations, self-psychology, cognitive behavioral). Interpersonal theory is ideally suited for this because it is an interdisciplinary and integrative framework that is evolving into a meta-theory for psychological science (Pincus & Ansell, 2013). Interpersonal theory has been applied to a wide variety of clinical topics including psychotherapy, symptom syndromes, personality disorders, health psychology, and behavioral medicine (Hopwood, Wright, Ansell, & Pincus, 2013). Interpersonal models have also been integrated conceptually and empirically with a diverse array of clinical theories including attachment, psychodynamic, social-cognitive, evolutionary, and neurobiological theories of personality, psychopathology, and psychotherapy (see Hopwood et al., 2013 for a review). Thus, interpersonal theory can serve as a common marker for personality pathology. Comprehensive. A construct capturing criterion A should also comprehensively account for both self and interpersonal dysfunction. Contemporary interpersonal theory (Pincus & Ansell, 2013) suggests that the entirety of interpersonal experiences and exchanges can be efficiently summarized through two broad meta-theoretical dimensions of agency and communion. Agency encompasses strivings for mastery, assertion, power and differentiation, which maps well onto the P&PD workgroup definition of self-functioning, including the ability to form a unique identity and strive for self-directed accomplishments. Communion encompasses strivings for connectedness, friendliness, and sharing with others and maps well onto the P&PD workgroup definition of interpersonal functioning, including the ability to understand and authentically connect with others (Pincus, 2011; Pincus & Hopwood, 2012). Interpersonal assessment measures are designed to include both agentic and communal themes, thus these measures are comprehensively capturing the DSM5 definition of GPD. Severity. Criterion A is defined by a single dimension of severity, which maps onto how interpersonal measures are routinely scored. Specifically, interpersonal measures often include a large first factor, labeled elevation. Elevation is computed simply by all of the items together to create a general score that reflects a general dimension of personality dysfunction incorporating agentic (self-functioning) and communal (interpersonal functioning) themes. Style/expression. An important (though complicated) part of the DSM5 proposal was suggesting that an assessment of personality pathology should include the severity of dysfunction and some markers of how that dysfunction is expressed. Interpersonal theory can accomplish this by calculating the interpersonal theme (angle) which further characterizes the type of interpersonal dysfunction. For example, interpersonal pathoplasticity is a technique to determine interpersonal subtypes within a diagnostic category that manifest different expressions of psychological disorder (Pincus & Hopwood, 2012). Many studies have shown that individuals with the same severity (elevation), but different styles of agentic (versus communal) interpersonal problems manifest differences in the expression and treatment outcomes of disorders such as depression (Cain, et al., 2012; Dawood, Thomas, Wright, & Hopwood, in press), generalized anxiety disorder (Przeworski, et al., 2011), social phobia (Cain, Pincus, & Grosse Holtforth, 2010), disordered eating (Ambwani & Hopwood, 2009; Hopwood, Clarke, & Perez, 2007), as well as personality pathology such as avoidant and borderline personality symptoms (Alden & Capreol, 1993; Ryan & Shean, 2007; Wright et al., 2013). Therefore, interpersonal models are already showing what the DSM5 proposal hopes to demonstrate with criterion B, namely demonstrating that differences in the expression of personality dysfunction (interpersonal subtype) are associated with clinically relevant outcomes. Wright and colleagues (2012) demonstrated that the pathological traits identified by the P&PD workgroup all evidenced positive associations with the global elevation of interpersonal problems, and the pathological traits could be further described through different associations with the dimensions of agentic and communal problems. This study demonstrates how interpersonal theory elegantly incorporates both a level of severity (elevation) and description of pathology (blends of agency and communion associations) within a single model. Clinical utility. Interpersonal theory can inform multiple treatment modalities of personality disorder. For example, Linehan (1993) suggests it is important to identify when the client twirls out of control and how to regulate that. Interpersonal theory (through the evaluation of normative social processes) can give structure to how these twirls can be understood and contained (Hopwood et al., 2013; see also Anchin & Pincus, 2010). Interpersonal theory has also inspired multiple types of interpersonal therapies, and provides specific theoretical contributions to the patient-therapist relationship, external relationships, catalysts for interpersonal learning, and much more (Benjamin, 2003; see review of therapies in Pincus & Cain, 2008). Importantly, the simple scoring routine (average to calculate elevation) will make it easier for a clinician to implement. The present study examined several interpersonal measures to demonstrate their comprehensiveness in capturing the GPD construct as it is defined by the DSM5. First, I constructed a measurement model to identify the four factors that represent self (impairments to identity, self-direction) and interpersonal (impairments to empathy, intimacy) dysfunction. Then I used the interpersonal measures to examine their association with each of these factors of the DSM5 description of GPD. Demonstrating that interpersonal measures are associated with each of the four GPD factors would provide support that the measures can indeed comprehensively capture the construct of GPD defined in the DSM5. Participants were 1526 adult (Agemean = 19.21, AgeSD = 2.04) college students (47% male). The majority (81%) of the sample identified as Caucasian, while 71 identified as African American (5%), 105 identified as Asian (7%), and 55 identified as Hispanic or Latino (4%). Participants completed an online survey in exchange for course credit. Interpersonal Measures of GPD. Interpersonal problems evaluate the distress associated with social behaviors one does too much, or is not able to do things effectively, and are consistent with the P&PD workgroup description of self and interpersonal impairment. It will be assessed using the Inventory of Interpersonal Problems-Short Circumplex (IIP-SC; Hopwood, Pincus, DeMoor, Koonce, 2008). Interpersonal strengths represent the ability to achieve self (agentic) and interpersonal (communal) goals, are also consistent with the workgroup description, and will be assessed using the Inventory of Interpersonal Strengths (IIS-32-32; Hatcher & Rogers, 2012). Both are short forms of longer well-validated parent measures (Locke, 2011). Construct Validity Measures. The definition of self and interpersonal impairment appearing in Section 3 of the DSM-5 was derived from an extensive review of clinician-rated measures of personality pathology (Bender et al,. 2011). Impairments to self-functioning were described as a thwarted capacity for identity (experiencing self as unique, boundaries between self and other, stable and accurate self-appraisal, capacity to regulate a range of emotional experiences) and self-directedness (pursuit of coherent and meaningful short term life goals, productive self-reflection, internal standards of behavior). Impairments in interpersonal functioning were described as a thwarted capacity for empathy (comprehension, focus, and tolerance of others’ motives and perspectives, a non-distorted view of social exchanges, understanding social causality) and intimacy (depth and duration of connectedness with others, desire for closeness, mutuality of regard reflected in interpersonal behavior). Several self-report measures were used to capture these impairments to self and interpersonal functioning (described below). All subscales will be scored in the maladaptive direction to facilitate interpretation. For each, I define what the subscale is and note (in parentheses) which aspect of the GPD definition it fits best with (also summarized in Table 1). These predictions will inform the hypothesized factor structure of the GPD definition measurement model. The Differentiation of Self Inventory (DSI; Skowron & Schmitt, 2003) captures the ability to separate self from others through four subscales. Fusion with others represents the overinvestment and enmeshment of parental figures combined with an inability to think for one’s self (identity). Emotional reactivity represents emotion caused by an unstable view of self (identity). I position represents the ability to commit to what one desires despite social pressure from others (self-direction). Emotional cutoff represents fears of intimacy resulting in withdrawing behavior (intimacy). The Self-rumination and self-reflection scales (SRSRS; Elliott & Coker, 2008) measured the capacity to reflect inward through two subscales. Reflection represented the ability to productively reflect and think about one’s self (empathy), and rumination represented the proclivity to punish the self and ruminate over things that went wrong (identity). Approach-Avoidance Temperament (AAT; Elliot & Thrash, 2002) uses two subscales to capture the biological sensitivity to reward (approach) and punishment (avoidance). This sensitivity is thought to underlie motivational systems (self-direction). The Trait Pride Facets Scale (TPFS; Tracy & Robins, 2007) is a 14 item self-report inventory assessing two descriptions of pride. Authentic Pride scale included the words accomplished, achieving, confident, fulfilled, productive, self-worth, and successful; meant to represent positive feelings derived from meeting goals (self-direction). Hubristic Pride scale included the words arrogant, conceited, egotistical, pompous, smug, snobbish, and stuck-up; meant to represent a self-aggrandizing style to combat feelings of shame, which may impede the development of mutual satisfaction in relationships (intimacy). The Interpersonal Reactivity Index (IRI; Davis, 1980) captures Davis’ multidimensional model of empathy (Perspective Taking, Empathic Concern, Fantasy, and Personal Distress; Davis, 1980, 1983). We excluded the personal distress scale because factor analyses demonstrated it loaded onto a different second-order factor suggesting it is not consistent with the construct of empathy (Pulos, Elison, & Lennon, 2004). Machiavellianism was measured using a 5-item version of the Machiavellianism-IV scale (Hunter, Gerbing, Boster, 1982; Rauthmann, 2013), which assesses belief that flattery is manipulative, rejecting honesty, rejecting the belief that people are moral, and accepting the belief that people are not trustworthy (intimacy). All criterion variables were scored in the maladaptive direction so the latent factors can be interpreted as impairments to identity, self-direction, empathy and intimacy. The IIS-32 measures strengths, and therefore negative associations with these impairment factors are predicted (unlike the IIPSC and ISC whose elevations represent dysfunction). 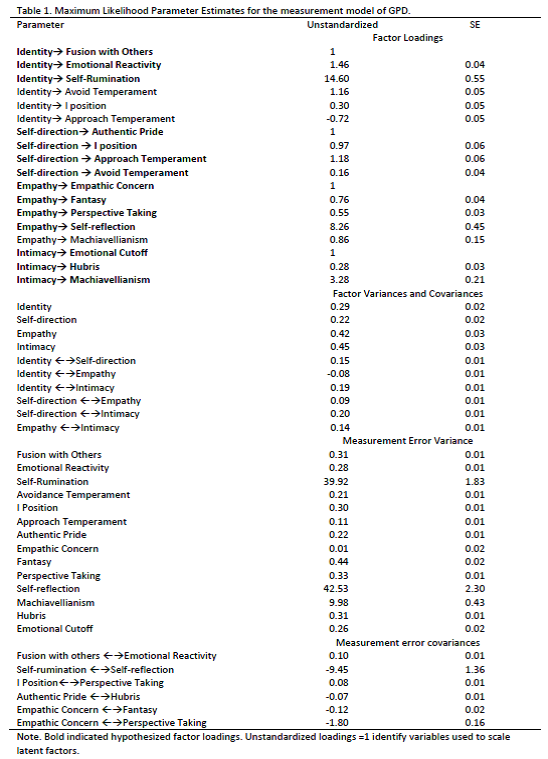 I first conducted confirmatory factor analyses to build a measurement model for the construct validity measures, representing the four factors of impairments to identity, intimacy, empathy, and self-direction. The initial structure was specified a priori, and modifications were made to reach adequate fit for the measurement model (see Table 1). I allowed significant cross-loadings between factors only when the cross-loading was within the same marker of dysfunction (e.g. approach temperament is a marker of identity and self-direction, both aspects of self-dysfunction and not factors of interpersonal dysfunction). I also modeled several correlated errors. Specifically, I allowed subscales that were from the same survey, but placed into different factors (e.g. self-rumination and self-reflection) to have correlated errors to account for survey-specific variance. The one exception to this was the I-position and perspective taking, which appeared to share variance related to focusing on self (versus others). The modified model reached adequate fit (see Table 2). Once an adequate measurement model was obtained, I entered each elevation score in separately as manifest variables predicting the four latent variables of GPD. The IIS-32 provided the most consistent evidence of capturing GPD. All beta weights were in the expected (negative) direction. 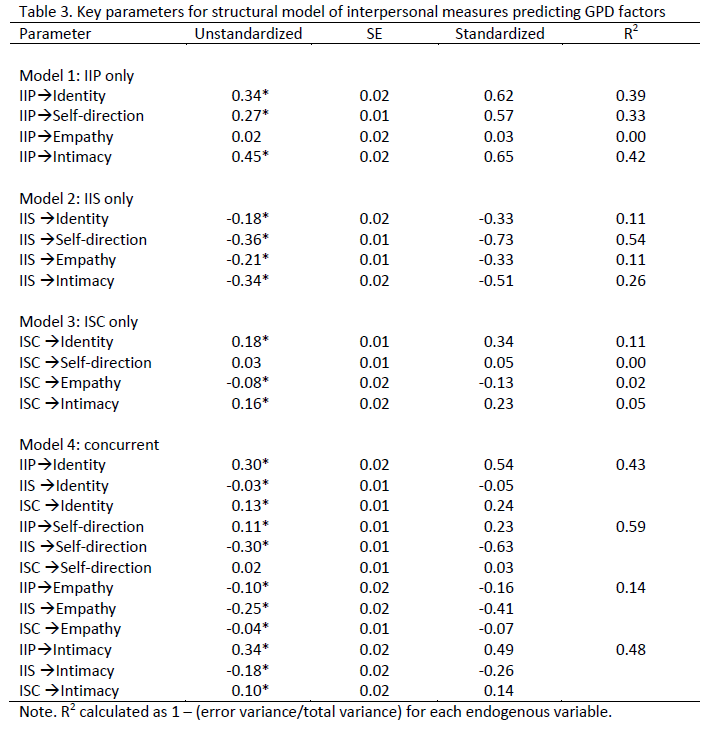 The IIS-32 predicted 11% of the variance for identity and empathy impairments, 26% of the variance for intimacy impairments, and 54% of the variance for identity impairments. The IIP also performed well, with all beta weights in the expected (positive) direction, and predicting between 33% and 42% of the variance for all factors except empathy. In contrast, the ISC predicted 11% of the variance in identity impairments, and only 5% of the variance in intimacy impairments. It did not significantly predict impairments to self-direction, and it predicted the opposite of impairments to empathy. Evaluated separately, it appears the IIS-32 most consistently identifies aspects of personality pathology identified in the DSM5 criterion A. The IIP also performs well, but appears to not predict empathy well. The ISC does not appear to capture the criterion A description well. Next, I entered all 3 elevations together to predict the four GPD factors. The total variance explained was not appreciably higher (3-4% higher) than the variance explained using the IIS-32 only. The one exception was impairments to intimacy, where the IIP substantially improves the variance explained (48%) compared to using the IIS-32 alone (26%). The present study investigated interpersonal measures as potential markers of the GPD construct. Using structural equation modeling, I demonstrated that several interpersonal measures are capable of capturing aspects of the GPD definition outlined in the DSM5. The IIS-32 appears to be the strongest marker of GPD, significantly predicting impairments to identity, self-direction, empathy, and intimacy. The IIP also appeared adequate, particularly in capturing impairments to intimacy, but did not appear sensitive to capturing impairments to empathy. However, observer reports (e.g. Pincus & Gurtman, 2003) may combine with self-reports of interpersonal problems to identify specific lapses of empathy. The ISC did not appear appropriate to capture many of the aspects of GPD. While employing several interpersonal elevation measures improved the amount of variance explained, the results were not large. Given the practical limitations to clinicians (administering multiple measures increases burden on the patients to complete and the clinician to score), and the appeal of mapping a single elevation onto a single dimensional rating of GPD, it may be useful to advocate for using a single interpersonal measure to capture criterion A. At only 32-items, and a simple average scoring routine, the IIS seems ideally situated for rapid adoption into clinical use. It was surprising that the IIP-SC and ISC did not perform better at capturing the aspects of GPD. However, this research was conducted on a student sample, and it may be that a clinical sample would lead to more consistent and significant associations with these measures of interpersonal dysfunction. It is also possible the IIS would not perform as well in a clinical sample. Therefore, it will be crucial to examine each of these measures in a clinical sample to determine if the effects from this study generalize. The sample was also predominately Caucasian, so the effects found here may not generalize to another more diverse sample. The present analysis relied on between-person statistical methods, and between-person effects may not necessarily apply to the single individual (such as a single clinical patient) (Molenaar & Campbell, 2009). It will be important to replicate these findings use person-specific analysis methods. The next planned extension of this research is to examine how interpersonal elevations predict daily symptoms of personality pathology (e.g. impairments to identity, empathy, etc.) which will provide further evidence that the interpersonal measures are helpful clinical tools to predict patient functioning. The IIS (or another interpersonal measure) should be incorporated into routine clinical assessment of personality pathology, consistent with the DSM-5 description of GPD. In order to facilitate this goal, future research should be conducted in clinical samples to determine whether there is a cutoff score for elevation that could indicate level of care decisions or treatment concerns. Much of the useful clinical material developed through interpersonal theory is aimed at describing personality pathology along the two dimensions of agency and communion (e.g. agentic complementarity, behavior covariation, copy processes identified along core dimensions of control and love) but relatively little attention has been given to the clinical implications of a high or low elevation score. More conceptual effort should be given to link this assessment score to clinically relevant issues. For instance, Kernberg (1984) identifies personality organization as continuum of personality pathology, with different therapeutic strategies, methods of interpretation, and content focused on at different levels of the continuum. Interpersonal theorists should consider whether interpersonal elevation scores could have similar clinically useful implications. In summary, interpersonal theory is a robust interdisciplinary theory capable of organizing various theories of personality pathology into a single framework. The IIS-32 is a 32-item measure, which efficiently captures the core aspects of GPD. Linking this assessment measure with DSM5 descriptions of personality pathology is a way to move interpersonal theory further into the clinical diagnostic process, and can open the door for more advanced discussions of the utility of interpersonal theory in clinical practice (e.g. interpersonal angle to describe expression of personality pathology). American Psychiatric Association, (2013). The diagnostic and statistical manual of mental disorders (5th Ed.). Washington, DC: American Psychiatric Press. Anchin, J. C., & Pincus, A. L. (2010). Evidence-based interpersonal psychotherapy with personality disorders: Theory, components, and strategies. In J. J. Magnavita (Ed. ), Evidence based treatment of personality dysfunction: Principles, methods, and processes (pp. 113–166). Washington, DC: American Psychological Association. Bender, D.S., & Skodol, A.E. (2007). Borderline personality as a self-other representational disturbance. Journal of Personality Disorders, 21, 500-517. Bender, D.S., Morey, L.C., & Skodol, A.E. (2011). Toward a model for assessing level of personality functioning in DSM-5, Part I: A review of theory and methods. Journal of Personality Assessment, 93, 332-246. Cain, N. M. Ansell, E. B., Wright, A. G. C., Hopwood, C. J., Thomas, K. M., Pinto, A., . . . Grilo, C. M. (2012). Interpersonal pathoplasticity in the course of major depression. Journal of Consulting and Clinical Psychology, 80, 78–86. Cain, N. M., Pincus, A. L., & Holtforth, M. G. (2010). Impersonal subtypes in social phobia: Diagnostic and treatment implications. Journal of Personality Assessment, 92, 514–527. Clarkin, J.F., & Huprich, S.K. (2011). Do DSM-5 personality disorder proposals meet criteria for clinical utility? Journal of Personality Disorders, 25, 192-205. Dawood, S., Thomas, K.M., Wright, A.G.C., & Hopwood, C.J. (in press). Heterogeneity of interpersonal problems among depressed young adults: Associations with substance abuse and pathological personality traits. Journal of Personality Assessment. Elliott, I., & Coker, S. (2008). Independent self-construal, self-reflection, and self-rumination: A path model for predicting happiness. Australian Journal of Psychology, 60, 127-134. Elliot, A. J. & Thrash, T. M. (May 2002). Approach-avoidance motivation in personality: Approach and avoidance temperaments and goals. Journal of Personality and Social Psychology,82, 804-818. First, M. B. (2005). Clinical utility: A prerequisite for the adoption of a dimensional approach in DSM. Journal of Abnormal Psychology, 114, 560–564. Hatcher, R.L., & Rogers, D.T. (2012). The IIS-32-32: A brief inventory of interpersonal strengths. Journal of Personality Assessment, 94, 638-646. Hopwood, C.J., Ansell, E.B., Pincus, A.L., Wright, A.G.C., Lukowitsky, M.R., & Roche, M.J. (2011). The Circumplex Structure of Interpersonal Sensitivities. Journal of Personality, 79, 707-739. Hopwood, C.J., Clarke, A.N., & Perez, M. (2007). Pathoplasticity of bulimic features and interpersonal problems. International Journal of Eating Disorders, 40, 652-658. Hopwood, C. J., Pincus, A. L., DeMoor, R. M., & Koonce, E. A. (2008). Psychometric characteristics of the Inventory of Interpersonal Problems–Short Circumplex (IIP–SC) with college students. Journal of Personality Assessment, 90, 615–618. Hopwood, C.J., Thomas, K.M., Markon, K.E., Wright, A.G.C., & Kreuger, R.F. (2012). DSM-5 personality traits and DSM-IV personality disorders. Journal of Abnormal Psychology, 121, 424-432. Hopwood, C. J., Wright, A.G. C., Ansell, E. B., & Pincus, A. L. (2013). The interpersonal core of personality pathology. Journal of Personality Disorders, 27, 270–295. Hunter, J. E., Gerbing, D. W., & Buster, F. J. (1982). Machiavellian beliefs and personality: Construct invalidity of the Machiavellian dimension. Journal of Personality and Social Psychology, 43, 1293–1305. Linehan, M. M. (1993). Cognitive-behavioral treatment for borderline personality disorder. New York: Guilford. Livesley, W.J. (2003). Practical management of personality disorder. New York: Guilford Press. Livesley, J.W. (2012a). Disorder in the proposed DSM-5 classification of personality disorders. Clinical psychology and psychotherapy, 19, 364-368. Livesley, J.W. (2012b). Tradition versus empiricism in the current DSM-5 proposal for revising the classification of personality disorders. Criminal Behavior and Mental Health, 22, 81-90. Locke, K. D. (2011). Circumplex measures of interpersonal constructs. In L. M. Horowitz & S. Strack (Eds. ), Handbook of interpersonal psychology (pp. 313–324). Hoboken, NJ: Wiley. Luyten, P., & Blatt, S.J. (2013). Interpersonal relatedness and self-definition in normal and disrupted personality development. American Psychologist, 68, 172-183. Lynam, D. R., & Widiger, T. A. (2001). Using the five factor model to represent the DSM–IV personality disorders: An expert consensus approach. Journal of Abnormal Psychology, 110, 401–412. Morey, L.C., (2005). Personality pathology as pathological narcissism. In M. Maj, H.S. Akiskal, J.E. Mezzich, & A. Okasha, World Psychiatric Association series: Evidence and experience in psychiatry (pp. 328-331). New York, NY: Wiley. O’Connor, B. P. (2005). A search for consensus on the dimensional structure of personality disorders. Journal of Clinical Psychology, 61, 323–345. Pilkonis, P.A., Hallquist, M.N., Morse, J.Q., & Stepp, S.D. (2011). Striking the (im)proper balance between scientific advances and clinical utility: Commentary on the DSM-5 proposal for personality disorders. Personality Disorders: Theory, Research, and Treatment, 2, 68-82. Pilkonis, P. A., Heape, C. L., Ruddy, J., & Serrao, P. (1991). Validity in the diagnosis of personality disorders: The use of the LEAD standard. Psychological Assessment, 3, 1–9. Pincus, A.L. (2011). Some comments on nomology, diagnostic process, and narcissistic personality disorder in the DSM05 proposal for personality and personality disorders. Personality Disorders: Theory, Research, and Treatment, 2, 41-53. Pincus, A.L., & Ansell, E.B. (2013). Interpersonal theory of personality. In J. Suls & H. Tennen (Eds. ), Handbook of Psychology Vol. 5: Personality and social psychology (2nd Ed.)(pp. 141-159). Hoboken, NJ: Wiley. Pincus, A. L., & Cain, N. M. (2008). Interpersonal psychotherapy. In D. C. S. Richard & S. K. Huprich (Eds. ), Clinical psychology: Assessment, treatment, and research (pp. 213–245). San Diego, CA: Academic Press. Pincus, A. L., & Hopwood, C. J. (2012). A contemporary interpersonal model of personality pathology and personality disorder. In T. A. Widiger (Ed. ), Oxford handbook of personality disorders (pp. 372–398). Oxford, UK: Oxford University Press. Pulos, S., Elison, J., & Lennon, R. (2004). The hierarchical structure of the interpersonal reactivity index. Social Behavior and Personality, 32, 255-360. Rauthmann, J.F. (2013). Investigating the MACH-IV with item response theory and preposing the trimmed MACH*. Journal of Personality Assessment, 95, 388-397. Ryan, K., & Shean, G. (2007). Patterns of interpersonal behaviors and borderline personality characteristics. Personality and Individual Differences, 42, 193-200. Skodol, A.E. (2012). Personality disorders in DSM-5. Annual Review of Clinical Psychology, 8, 317-344. Skowron, E.A., & Schmitt, T.A. (2003). Assessing interpersonal fusion: Reliability and validity of a new DSI fusion with others subscale. Journal of Marital and Family Therapy, 29, 209-222. Tracy, J. L., & Robins, R. W., (2007). The Psychological Structure of Pride: A Tale of Two Facets. Journal of Personality and Social Psychology, 506-525. Watson, D. (2005). Rethinking the mood and anxiety disorders: A quantitative hierarchical model for DSM–V. Journal of Abnormal Psychology, 114, 522–536. Widiger, T. A., & Clark, L. A. (2000). Toward DSM–V and the classification of psychopathology. Psychological Bulletin, 126, 946–963. Widiger, T.A., & Trull, T.J. (2007). Plate tectonics in the classification of personality disorder. American Psychologist, 62, 71-83. Wright, A.G.C., Hallquist, M.N., Morse, J.Q., Scott, L.N., Stepp, S.D., Nolf, K.A., & Pilkonis, P.A. (2013). Clarifying interpersonal heterogeneity in borderline personality disorder using latent mixture modeling. Journal of Personality Disorders, 27, 125-143. Wright, A.G.C., Pincus, A.L., Hopwood, C.J., Thomas, K.M., Markon, K.E., & Krueger, R.F. (2012). An interpersonal analysis of pathological personality traits in DSM-5. Assessment, 19, 263-275.